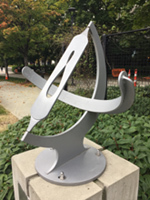 At the Simon Fraser University's Burnaby campus, opposite the entrance to the Administration Building and next to the Trottier Family Observatory. Approached from along the main path between the line of buildings you may miss the dial. From that perspective it is partially hidden. "Dial constructed at BCIT by Blanco Lam and Jacob Maloney, supported by Dave Lewis (head of the Mechanical Manufacturing program at BCIT). Designed by Dr. Len Berggren, SFU and Brian Albinson. Materials donated by BCIT with additional financial support from the Department of Mathematics at SFU and the North American Sundial Society. The generous support of the Trottier Family Foundation is also gratefully acknowledged."